It's been an even more interesting than usual past couple of weeks come dinner time in here, at the Western PA homefront of the WGaTJ's crew. In one corner, there's me, trying to stick true as best as possible to that pesky Paleo diet, making only occasional concessions for you, our readers. Great results so far - haven't weighed as little as I do now since the Bush administration, and by that I probably mean not the W one. Still got some work to do, though. In the other is my wife Sandy, nearing 8 months pregnant, after a long day of wrangling other people's kids at her preschool before tackling our own sweet little toddler for a couple hours while trying to make dinner while waiting for me to get home from work. Is she entitled to be hungry for whatever and that just has to be okay with me? No question, absolutely. But do I want to keep watching what I eat to keep on track? No doubt. Add in tiredness from work, lack of willingness from either of us to make two separate dinners, and pressure to maintain the appearance that we know what we're doing and not psychos less we equally confuse and confound our aforementioned two year old and teenaged foreign exchange student we're hosting, and, well, it's been a delicate dance at times. At least neither of us is losing. 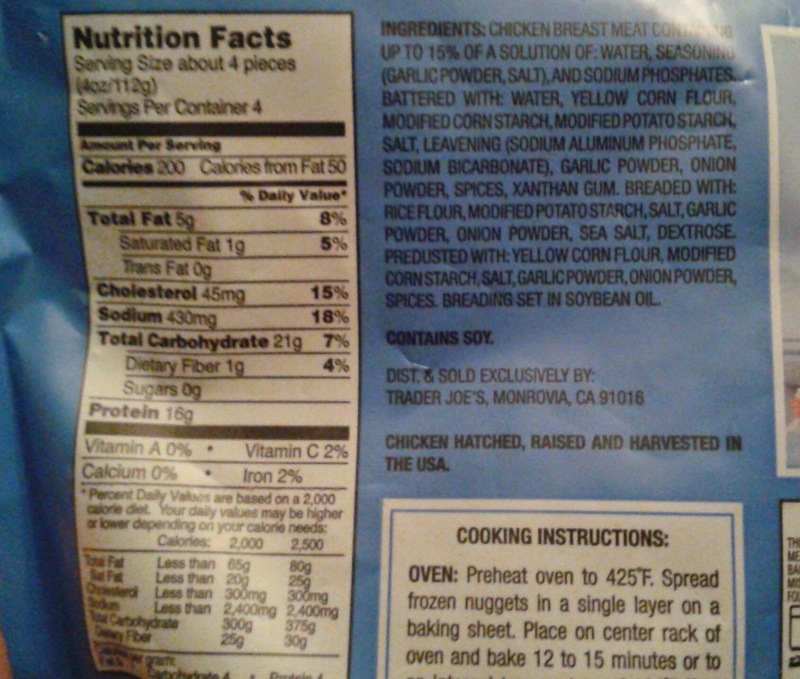 How do Trader Joe's Breaded Chicken Breast Nuggets fit in? Not in my caveman diet - oh, that pesky breadedness with all those yummy, crunchy, metabolism-killin' carbs. But, they're a good example of the compromise we've brokered - I eat Paleo for breakfast and lunch (not too hard during the week) and at dinner, we make reasonably healthy choices (these were a "one of those nights" bagged dinner nights) and I watch my portion sizes. Dropped a couple more pounds this week, so it doesn't seem to hurt too bad. 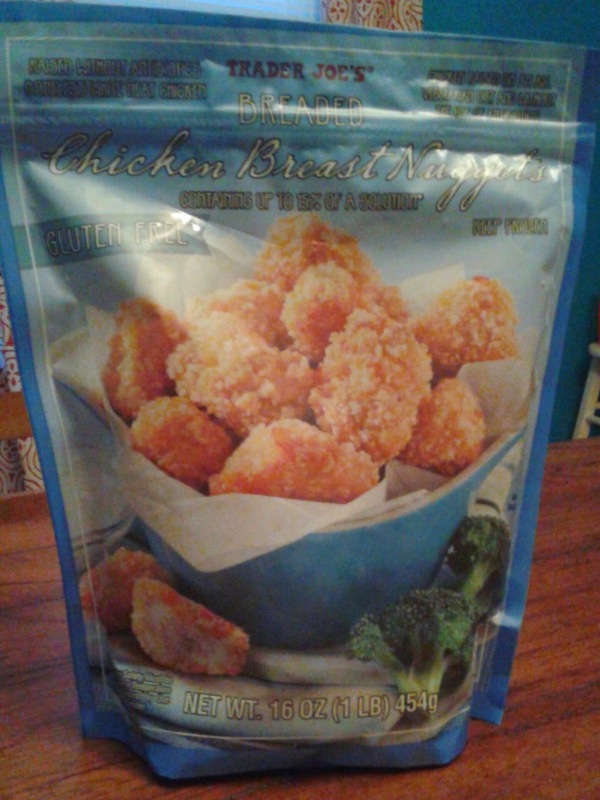 Besides being a symbol of peace thankfully made of chicken, not doves, these nuggets are pretty darned tasty too. That is, if you can call them nuggets - they're more like huge chunks of white chicken. Seriously, I'd say almost half the mega-nuggies we got were several bites each, and huge. Even better, it was actual chicken too, not the stuff that Snopes swears doesn't compose your McNuggets (jury's out if you ask me). I kinda liked how the bag proudly proclaims that the chicken contains up to 15% of a solution, implying that being 85% problematic is fine. Sorry, lame joke. As a small nod towards my 'lithic-classed leanings, the breading is also gluten free, relying instead on cornmeal and the like. While that still DQs this from any stone-aged supper, the cornmeal does add a pretty nice crunch, and a certain almost homemade flair. None of the seasonings particularly stand out, but instead keep themselves balanced nicely that make this chicken ideal for chunky-dunking into a dip of your choice, such as some barbeque sauce. Overal, I gotta say, both the wife and I are fairly pleased. There's something a little fishy about them, though, which I can't quite figure out. Somehow, when eating these, I thought I was tasting something a little seafood-y. It's nothing unpleasant - I won't call fowl play on it - but I still couldn't quite shake that thought. Maybe it was the salt (trying to cut down that, too), I don't know. Regardless, we liked 'em. The birdy bits were a reasonable price ($5 for the sack) and will probably be a repeat purchase soon. Matching fours. tried these baked first,...yuck whatever coating is on these is not good. Then of course I had the rest of the bag to eat. So tried deep frying these,.....yuck. Again the coating is tough there's no chicken taste to these things. Will not buy again, do not recommend.